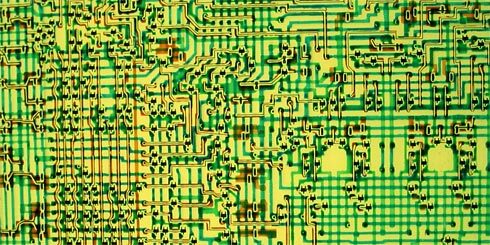 Have you ever seen the inside of a microprocessor before? Today I’m excited to share with you my visit to a wonderful free museum in Silicon Valley where I had a chance to meet true artifacts from technology history face to face. As I said before, I had joined forces with two fellow travellers from Austria to explore the best of Silicon Valley. And, as you can probably imagine, that day we visited many incredible and historical locations, including the Googleplex, Intel’s headquarters, Apple’s campus, and the famous Computer History Museum. So today I’m going to continue the tale of that incredible day by telling you about our stop at Intel, which turned out to be a bit more welcoming than Google was, for reasons which I’ll get into. To be frank, I found Intel’s headquarters to be more inviting than Google’s. Even Intel’s lobby seemed significantly more relaxed. Although Intel Museum adjacent to the lobby had a lot to do with that. A number of things jumped out at me while I explored the Intel Museum, and today I’m going to focus on the top 5 most awesome exhibits, because they changed how I thought about microprocessors forever. 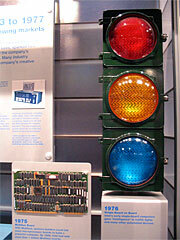 Did you know that, as early as the mid-1970s, Intel’s computers were giving intelligence to traffic lights? 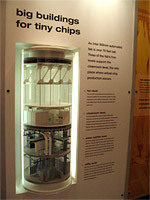 This exhibit is one of the first you’ll see when you enter, and it highlights some practical uses of microprocessor technology that I’d never considered. Some of the displays even seemed to be written in a nostalgic style, possibly because they were written by those who actually worked in the industry during the 1970s when the microchip revolution was occurring. It’s truly amazing when you stop and think of the unprecedented change that has occurred in the computer industry over the last 40 years, and my amazement only increases when I also consider how that change has rippled out to affect every other industry on the planet. Even the existence of this website is a reflection of that revolution. Still, it is fun to reminisce about the good old days. The photo above shows only a segment of the entire processor, and if you think that’s cool, consider this: that’s a photo of an early processor. 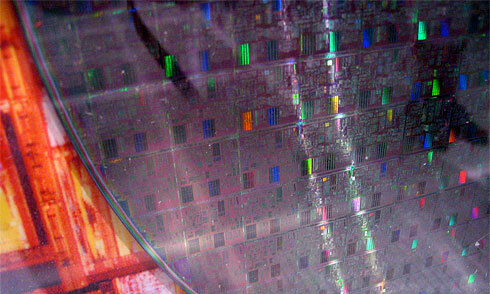 Today’s chips have millions and millions of transistors! See those colorful squares in the wafer above? Those are dozens of Pentium 4 chips. Think of it as making a batch of cookies. Would you only put one cookie in the oven? Of course not! That would be a complete waste of time if you wanted more than one cookie. Sheesh, what’s the deal with these technology/food crossover words? Wafers, chips… You’d think that computer engineers aren’t fed enough or something. Or is it that they’re fed too much? Anyway, the batch of cookies analogy applies here because when Intel makes a batch of processors, they etch dozens and dozens of them onto large wafers like this. And since Intel makes millions of processors per year, they find that manufacturing the chips on a grid to be very efficient. That way, the same processes to make a chip can be applied to all the chips on a wafer at once, saving immeasurable amounts of time. Far from a source of inebriation, a “fab” is technical slang for a semiconductor fabrication plant. Basically, it’s a magical place were microprocessors are made, including the one that you’re using to browse the web right now. And while exploring the museum, I came across this detailed model of a fab plant (pictured right) which explains the purpose of each of the four levels of a fabrication plant in detail. Isn’t it incredible how much goes into creating our modern microprocessors? This fab model was pretty intriguing. For instance, did you know that processors can only be produced at certain temperatures and humidity levels? That’s why, directly above the clean room where processors are produced, there’s a level called the fan deck which carefully maintains temperature, humidity, and air purity. And below the clean room is a “subfab” level where most of the power transformers, pumps, and other support systems are. As you can see, these multi-level fabrication plants are delicately balanced ecosystems, carefully designed so that microprocessors can be born and live out a long healthy life. Who knows, the next chip Intel makes could end up inside a pacemaker that keeps you alive someday. 5. 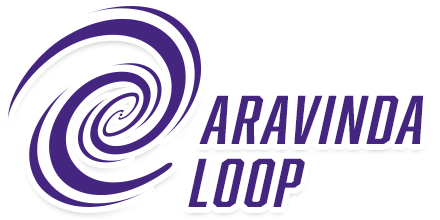 Excellent Interactive Video exhibits, and much more. Overall, the amount of thought and care that went into the Intel Museum surprised me. I was impressed at how much effort had been put into retelling the history of the microprocessor, including interactive video exhibits. One exhibit that sticks out in my mind was an interactive display showing excerpts of Robert Noyce’s journal, one of Intel’s founders. And when I read about the early days at Intel, I was struck at the uncertainty founders of Intel had to endure in those early days. They knew they were on the right path, but it still took time for them to “calibrate” before they began to resemble the Intel we know now. 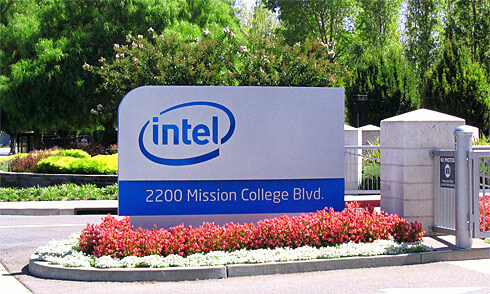 For instance, did you know that Intel’s original name was NM Electronics during their first year? The founders soon revised the name and decided to call it Integrated Electronics, eventually shortening it to the “Intel” that we know today. Even though I can’t say the Intel Museum is my favorite museum in the valley (that title goes to the Computer History Museum), it’s definitely a fun place to explore. 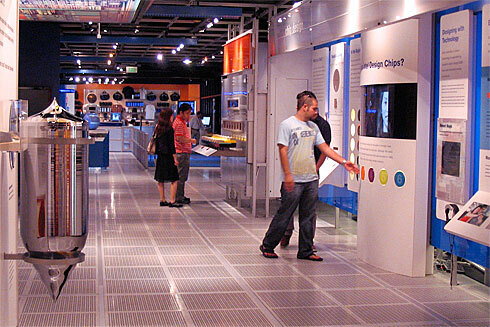 And while the Intel Museum is admittedly rather Intel-centric, it is nonetheless a fun place to visit to experience the history of the microprocessor and the fascinating way that they’re produced. 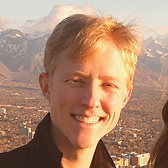 It can be adequately explored in about an hour and is provided free of charge. In fact, by adding a museum to their headquarters, Intel is helping educate the public, improve public perception (and goodwill) towards Intel, and help put a friendlier face on the company. I hope you enjoyed this overview of my visit to the Intel Museum. I really enjoyed taking the time to explore it. As always, Marco the Spacefarer followed me and appears in all 18 photos in the photo gallery that accompanies this article. Can you find him in all 18? Or, for more explorations of great little museums like this one, you can also check out: 15 of the Best Small, Quirky, and Unusual Museums in the US from our friends over at BootsnAll. This is cool! Looks like a great time!